Experience Being from the context of the Soul’s reality, and realize how to use that consciousness to live a more fulfilling & purposeful life. Experience Being aware of the authenticity of your inner voice and your soul's innate desire, clarity & wisdom. Experience Being in a healing cocoon where emotional suffering can be healed and used as a doorway to Spiritual Awakening. 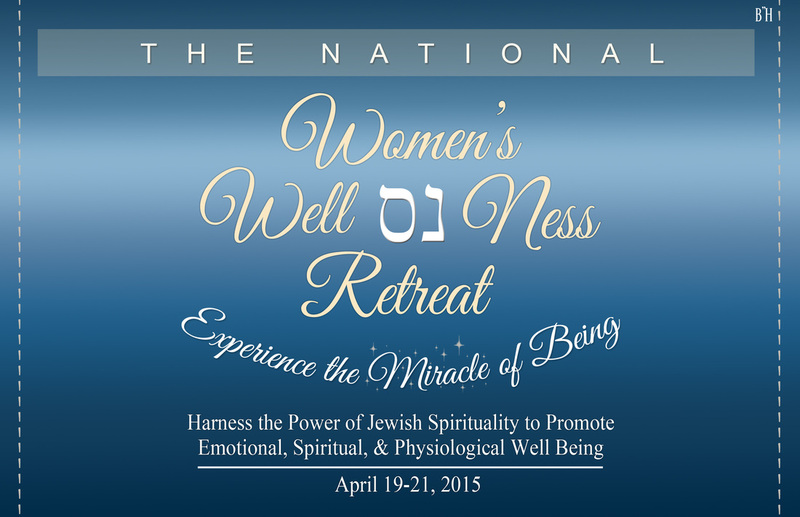 Experience Being in Jewish meditation and manifesting transformation of an emotional, spiritual or physiologic habit. Experience Being cherished by Unconditional Loving and being grateful to Hashem for every aspect of your human experience. Experience Being inspired, nurtured & rejuvenated with like- minded women! Nomi Freeman is passionate about showing women how to use Jewish Wisdom and Kabbalah to live healthy, purposeful and connected lives- permanently. She uses meditation and centering techniques to teach women how to choose their personal inner space to thrive. Mrs. Freeman has lectured extensively around the USA, in Vancouver, Toronto, Montreal, New York and Buenos Aires. She covers topics ranging from Personal Spiritual Development, to Kabbalah and Parenting Children to Care. An experienced wife, mother, author, successful educator and mentor with over twenty five years of experience, Nomi is known for her warm, kindhearted approach and sympathetic ear, combined with highly effective tools and techniques that work. Shira Teleshevsky is the Founder & Director of The Women's Spirit Center. She has formed a series of meditations based on Chassidic teachings to guide you on a path of connection to your soul; your inner voice, your guiding light and your well of love. Shira's uniqueness emerges in her love for presenting the Chassidic approach to connecting with The Divine that allows you to be at peace with your authentic self; your unique mission in life, and your experiences that have lead you to this day. The transformation that follows promotes personal harmony, health and liberation. Ruth holds a Master’s Degree in Clinical Psychology and a Master’s Degree in Spiritual Psychology with an emphasis in Consciousness, Health & Healing. Ruth Klein is CEO of her firm, Expert Celebrity™ Branding, and is a best-selling author of six books which have been translated into Mandarin, Portuguese, Chinese and Russian. Her performance strategies help women increase efficiency and meet the demands of personal and professional life with less stress and with deeper purpose. She helps her clients create Personal and Business Brands that create financial and spirit-rich businesses. Ruth has been interviewed in O:The Oprah Magazine, CNBC, Prevention Magazine, Washington Post Online, ABC, NBC, Fox and CBS as well as many others. Rebbetzin Miriam Cunin is a dynamic example of A Chassidic Matriarch in her family and the world today. Rebbetzin Miriam Cunin, a gifted wordsmith, poet and artist - teaches classes on marriage and family, and advises women internationally. "Her son points to his mother's private accomplishments, as well. She spends every Friday afternoon going to old age homes, where she lights Shabbat candles with 70 or 80 patients who consider her a daughter (some patients with dementia actually think she is their daughter). She brings new mothers prayers and a care package.And then, of course, there is the job of being a mother and bubbie to a family the size of a small company. Susan Vorhand earned her PhD in Depth Psychology at Pacifica. Dr. Susan Vorhand's approach of soul-centered psychotherapy combines psychology and kabbalistic mysticism to achieve a unique integrity of the inner self. Dr. Vorhand explores her own personal experiences and those of others to give real life examples of healing, ranging from self-doubt to eating disorders. She lectures, leads workshops and facilitates support groups with an emphasis on Soul-Centered therapy, and is the author of the book The Mosaic Within: An Alchemy of Healing Self and Soul. Rebbetzin Rochel Schmukler is a Self Dicovery Consultant of the most unique form. Rochel's uniqueness expresses itself in her ability to combine the wisdom of Torah with the art of Graphology and Personal Analysis to create a Laser- Sharp vision into the personal discovery and fulfillment of each individual. Rebbetzin Rochel Schmukler, also a gifted poet, writer and speaker, teaches classes on personality, marriage and torah, and counsels women and couples nationally. Rochel helps facilitate the journey to that inner space to support the individual or couple in defining unique goals for relationships, parenting and career. Her talent shines in the smiles of the face of a women or couple who have just met with her. What they are smiling so sweetly about is not necessarily her: it is them. That smile is a reflection of their new self- awareness and clarity: a gift that is high in demand in our modern world. It is truly a gift that keeps on giving. Click here to register online, or call our office at 310.454.7783.